September 14, 2017 – NASA’s Cassini spacecraft is on final approach to Saturn, following confirmation by mission navigators that it is on course to dive into the planet’s atmosphere on Friday, September 15. After almost 20 years in space, NASA’s Cassini spacecraft, carrying the University of Colorado Boulder LASP-built UltraViolet Imaging Spectrograph (UVIS), will conclude the final chapter of its remarkable story of exploration with an intentional plunge into the planet to ensure Saturn’s moons – in particular Enceladus, with its subsurface ocean and signs of hydrothermal activity – remain pristine for future exploration. The spacecraft’s fateful dive is the final beat in the mission’s Grand Finale, 22 weekly dives, which began in late April, through the gap between Saturn and its rings. No spacecraft has ever ventured so close to the planet before. The mission’s final calculations predict loss of contact with the Cassini spacecraft will take place on September 15 at 5:55 a.m. MDT (7:55 a.m. EDT). 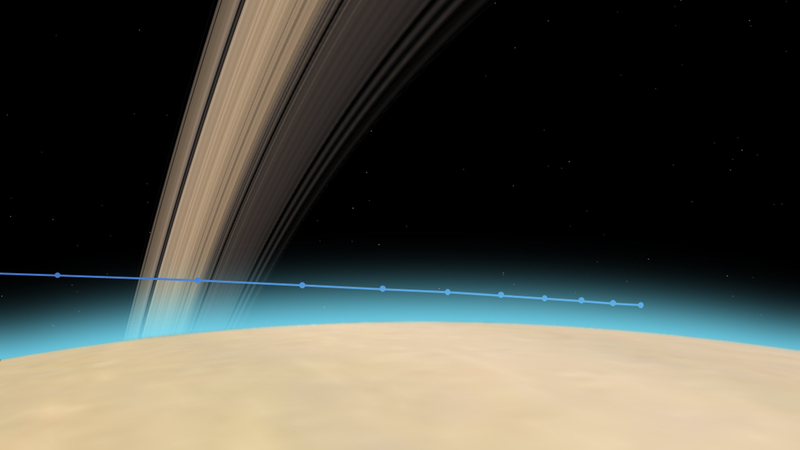 Cassini will enter Saturn’s atmosphere approximately one minute earlier, at an altitude of about 1,190 miles (1,915 kilometers) above the planet’s estimated cloud tops (the altitude where the air pressure is 1-bar, equivalent to sea level on Earth). During its dive into the atmosphere, the spacecraft’s speed will be approximately 70,000 miles (113,000 kilometers) per hour. 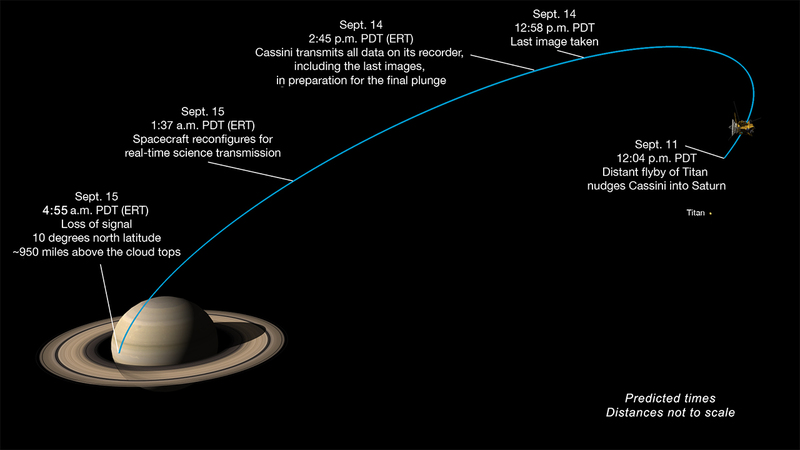 The final plunge will take place on the day side of Saturn, near local noon, with the spacecraft entering the atmosphere around 10 degrees north latitude. The Laboratory for Atmospheric and Space Physics is inviting the public to join some of the Cassini team in Boulder as they mark this significant milestone and celebrate one of NASA’s most successful missions ever by tuning into NASA TV coverage, hearing some brief live presentations, and enjoying breakfast snacks and coffee. CU Boulder Professor Larry Esposito has been eying the fabulous rings of Saturn for much of his career, beginning as a team scientist on NASA’s Pioneer 11 mission when he discovered the planet’s faint F ring in 1979. The UVIS instrument will be turned on during Cassini’s final dive into Saturn’s atmosphere and will be routing data to Earth until the mission is over, said Esposito, one of many mission scientists who are gathered at NASA’s Jet Propulsion Laboratory (JPL) in Pasadena, California, for Cassini’s grand finale. Due to the travel time for radio signals from Saturn, which changes as both Earth and the ringed planet travel around the Sun, events currently take place there 83 minutes before they are observed on Earth. This means that, although the spacecraft will begin to tumble and go out of communication at 4:31 a.m. MDT (6:31 a.m. EDT) at Saturn, the signal from that event will not be received at Earth until 83 minutes later. Live mission commentary and video from JPL Mission Control will air on NASA Television and the agency’s website from 5 to 6:30 a.m. MDT (7 a.m. to 8:30 a.m. EDT) on September 15. A post-mission news briefing from JPL is currently scheduled for 7:30 a.m. MDT (9:30 a.m. EDT), also on NASA TV.